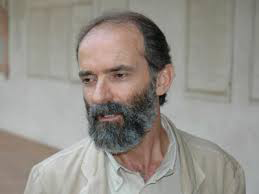 Gëzim Hajdari was born in 1957 in Hajdaraj, Albania, from a family of land owners whose property was confiscated during the Communist dictatorship of Enver Hoxha. He acquired his early education in his home town, trained as an accountant in the district town of Lushnje, then graduated in Albanian Language & Literature at the “A. Xhuvani” University in Elbasan and in Modern Letters at the “La Sapienza” University of Rome. He has had a variety of jobs including (in Albania) factory worker, field guard, warehouse man, accountant, land reclamation worker, military serviceman with former convicts, & then, after the fall of the Communist regime, language & literature teacher; and (in Italy) stables cleaner, hoeman, labourer, assistant typographer. At the moment he makes a living lecturing at Italian & foreign universities where his work is the subject of study. In winter 1991, Hajdari was among the founders of the opposition Democratic & Republican parties of the town of Lushnje, and was elected Republican district secretary. In the same year, together with fellow poet Shpend Sallaku, he co-founded the opposition weekly Ora e Fjalës & worked as its vice-director while also contributing to the national daily Republika. In the 1992 political elections he ran as a Republican parliamentary candidate. In the course of his intense political activity & his work as a journalist, Hajdari often spoke out against the crimes & abuses perpetrated by the old Hoxha regime & by the post-Communist government. For this & other reasons, following repeated threats, he was forced to leave Albania in 1992. Since 1993 Hajdari, who writes both in Albanian and Italian, has published twelve collections of poetry, two travel books, a long essay (Albanian Epicedium) in memory of the poets & writers imprisoned & murdered by the Hoxha regime, & several translations, including Këngët e nizamit (a collection of the songs of Albanian soldiers conscripted in the Ottoman army). He is the director of the “Erranze” series for Italian publishing house Ensemble & president of the Centro Internazionale Eugenio Montale. His poetry has been translated into several languages & won many awards. A book of essays dedicated to his work was published by Cosmo Iannone in 2010. For his literary merits, Hajdari has been nominated honorary citizen of Frosinone, the Italian town south of Rome where he has lived in exile since 1992.
on the journey towards fragile skies. the doors of each & every black prison. from fire to fire, from water to water. with the eternal will of the Sun god. & torment myself in Albanian.